Since the Republicans regained a majority in the House in 2010, we’ve gotten used to seeing everything come down to the last minute. Congress and the White House can’t agree on the basic bills that have to pass to keep the government running — to put Social Security checks in the mail and keep the national parks open — so again and again high-stakes negotiations between Speaker Boehner and President Obama have been necessary to craft a last-minute compromise that nobody likes. That was the story of the debt ceiling, the fiscal cliff, the sequester, and so on. So talk about another showdown when the new fiscal year starts in October may seem like same-old same-old: Everyone will posture, doomsday clocks will tick towards zero, and chaos will loom, but eventually Obama and Boehner will go into a room and come out with something that keeps the worst from happening. Both sides will rail about how unacceptable this agreement is, but ultimately majorities in Congress will accept it and life will go on. This time might be different. Boehner will likely end up playing Chicken again, but this time it’s not clear he even has brakes or a steering wheel. It’s not his driving I question, it’s his vehicle. Increasingly, the House Republican majority is losing the cohesion necessary to be part of the governing structure. Congressional Republicans can come together to block what President Obama wants, but they can’t come together on a program of their own. In September, Speaker Boehner will likely go into that room with no position to negotiate from and no ability to pass a compromise without relying mainly on Democratic votes — and the prospect of losing his speakership if he does. To understand what’s happening, you need to appreciate things on two levels: the mechanics of the appropriations process (where things are starting to fall apart) and the underlying illusions in the minds of the conservative rank-and-file. Legislative failure I: the farm bill. In the last few months we’ve seen some spectacular legislative failures in the House. First when the farm bill failed in June. The farm bill is a compromise that goes back to the 70s: Democrats get money for food stamps and Republicans get money for farm subsidies. Poor people going hungry and small farmers losing their land are two images that raise a lot of public sympathy, so for decades neither party has wanted to scuttle the deal. Until June. The Senate passed a traditional compromise farm bill (with some moderate cuts on both sides) 66-27. But the House bill included $20 billion in cuts to Food Stamps over ten years — too much for Democrats but not enough for the most conservative Republicans. So it lost 234-195. Subsequently, the House passed a farm-subsidies-only bill and is drafting a separate bill with $40 billion in Food Stamp cuts. The usual practice would be for a joint House/Senate conference committee to iron out differences in their respective bills, but so far the House is refusing to appoint its conferees. At the moment, nobody sees a clear path to a bill that can be passed by both houses and signed by the president before all authority for food stamps and farm subsidies vanishes on October 1. Legislative failure II: T/HUD. This week both houses went home for the summer recess after failing even to vote on the appropriations bill that funds the Departments of Transportation and Housing and Urban Development. T/HUD is another one of those bipartisan bills that — after some tussle and a few close votes on amendments — usually passes by wide margins, because it includes some of the most visible, most popular spending the government does. It rebuilds bridges, widens highways, and opens new parks. The Senate could have passed a bill had one come to a vote, but Mitch McConnell led yet another filibuster. In the House, the T/HUD bill was pulled from the calendar when the leadership realized they couldn’t pass it. In normal times, the House and Senate would each pass a budget, the differences between those budgets would be resolved, and appropriators in both chambers would have binding limits both on how much money to spend, and on which large executive agencies to spend it. But this year the House passed the Ryan budget and the Senate passed something much closer to what we’ve been doing. Senate Republicans have blocked the Senate from appointing conferees to work out the differences. OK, so what? Well, a budget is just a list of numbers; it doesn’t specify exactly what does and doesn’t get paid for. (It’s like when a husband and wife agree to reduce their annual food budget, but leave for later whether they’re going to cut back on steak or quiche.) The nitty-gritty happens in the appropriations process, in bills like T/HUD and the farm bill. But they can’t do it. It turns out that when you draft bills enumerating all the specific cuts required to comply with the budget’s parameters, they don’t come anywhere close to having enough political support to pass. Even in the GOP House. Slash community development block grants by 50 percent, and you don’t just lose the Democrats, you lose a lot of Republicans who care about their districts. Combine that with nihilist defectors who won’t vote for any appropriations unless they force the President to sign an Obamacare repeal bill at a bonfire ceremony on the House floor, and suddenly you’re nowhere near 218 [votes in the House, i.e., a majority]. That’s not just a problem with T/HUD. 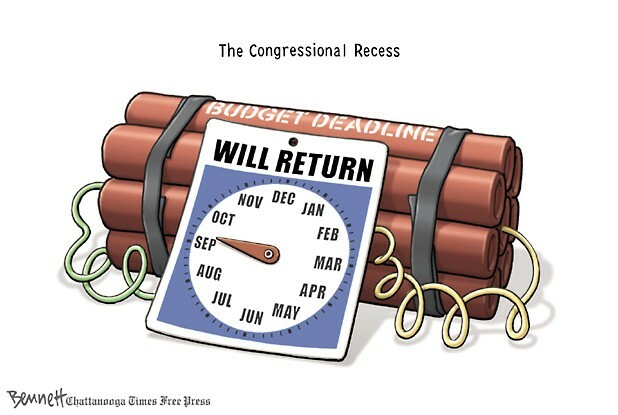 It’s a problem for all the appropriations bills that need to pass by October 1. The Ryan budget never worked, except as a promised land that the evil Obama and nasty Senate Democrats kept Republicans from reaching. But now they’ve blundered into a position where they have to produce photos of their promised land. And their voters are not going to understand why they can’t do it. ObamaCare and Immigration. If it’s that hard to keep funding popular programs that specifically help your district, what about controversial stuff like ObamaCare and immigration reform? We will have a vote on a series of bills at some point, Chris. It will deal with a variety of issues. In other words, the farm bill is the model. The House will divide the Senate bill up, pass the parts that please conservatives and not pass the parts that please liberals. The bills they pass will all die in the Senate, where they need some Democratic votes. But at least that won’t shut the government down, it will just kick the can to a future Congress. On ObamaCare, the Tea Party folks in Congress are pushing an Alamo-like stand, where Republicans will shut down the government until Democrats agree to defund implementation. Karl Rove and Tom Coburn think this is madness, but it’s a crowd-pleaser if you’re only worried about winning a Republican primary. Political fantasy meets reality. Poll after poll shows the same thing: Ask Americans if they want the government to spend less, and they say yes. Ask them specifically whether the government should spend less on the things the government spends almost all its money on — healthcare, Social Security, defense, homeland security, roads, schools, air traffic control, food safety, disease control, disaster relief, … — and they say no. The difference is fantasy spending: Bridges to Nowhere, foreign aid to countries that hate us, welfare fraud, and a bunch of other “government waste” that serves no legitimate purpose and could be slashed to zero without hurting anybody. Ask people — especially conservatives — how much of the federal budget is spent on such stuff, and you’ll hear ridiculous answers like half or more, rather than the actual drop-in-a-huge-bucket. So the ideal political position to run on (if your opponent will let you get away with it) is that you’re going to make vast unspecified budget cuts that won’t actually hurt anybody. It’s nonsense, but it’s nonsense people will believe — until you have to make good on the details. Conservative politicians and media personalities have been feeding this fantasy in the rank-and-file for decades, and now they can’t control it. Republicans know that it is death to go into a primary battle with a Tea Party challenger and try to make conservative voters deal with reality. But now the leaders themselves have to deal with reality as legislators, and their primary voters are watching. I am most frustrated by the farm bill. The Republicans in the house pass a bill that essentially is welfare for Corporate farmers and then claim they can not help the poor. Liberals need to call them out not only on fantasy land but – Hey your position does not hold when it comes to corporations. Why are you willing to bail out corporate America? The house republicans should be put on trial under the RICCO statute. Or just bring ’em up on charges of treason. I’ll assume you’re not serious about this, or maybe you’re parodying me. Taken literally, your suggestion is on a par with Michele Bachmann’s idea that liberals in Congress should be investigated to see if they are “anti-American”. What I want to do literally is hold up to the public these examples of party-over-country thinking and hope that in the future they will elect people who put country first. People will only put country first if country does something for them. The days of being a productive citizen are over. Now, people see that someone is getting something for free (whether it be a CEO or medicaid) and they want some of that too. So they rush in, drain the system and then rush out before they’re the last one stuck with the tab. Last call is coming fast.